The Transparency Reporting Toolkit is a project by New America’s Open Technology Institute (OTI) and Harvard University’s Berkman Center for Internet & Society. Using research on the current state of transparency reporting, the project aims to identify best practices, create a template transparency report, and establish reporting guidelines. These resources will be shared publicly to foster standardization in reporting and provide companies new to reporting with an easy-to-use set of tools essential to crafting their transparency reports. Having surveyed the landscape of transparency reporting and identified best practices in reporting, we are working to translate that research into a template and guide to best practices. 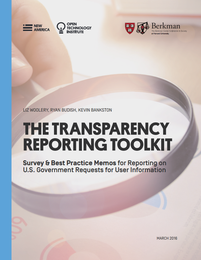 The result is The Transparency Reporting Toolkit’s Template & Guide to Reporting. With both the Survey & Best Practice Memos and the Template & Guide to Reporting completed, the final piece of the toolkit, the online portal, is on the horizon. Working with a Mozilla-Ford Open Web Fellow, we have started to build the interactive portal. This website will help companies create and publish reports in a format that utilizes best practices, help researchers translate existing reports into a standardized format, and help consumers of these reports make the best use of the data. Over the past two years we have synthesized the various dialogues from our interviews and convenings and additional research into a document that surveys current practices and identifies the best practices of existing transparency reports. There is such a vast array of approaches and practices within current transparency reports that is impossible to address all questions or resolve all tensions. The Transparency Reporting Toolkit, including these Survey & Best Practice Memos and the attendant Reporting Guide & Template (forthcoming), is our attempt to start the discussion.